The best way to get to know a community is by scheduling a tour. See the facilities, meet the staff and residents, and get a feel first hand what it's like to live at Glassford Place Assisted Living. Serving the needs of those searching for an assisted living option in Prescott, Glassford Place provides both long-term and short-term care solutions. To help foster a feeling of home, pets are welcome in our community. Enlivant is proud to be involved in the management of Glassford Place. Teamwork, compassion, excellence and success are the four cornerstone principles that guide the staff and executives at Enlivant. We offer apartments in both private and companion arrangements. Amenities in each apartment include a kitchenette with a microwave, as well as an emergency call system. Visiting family or friends from out of town have the use of our on-site guest accommodations. Residents of our community can always find plenty of ways to stay busy, such as reading in the library and taking strolls in the courtyard. In addition, residents can access the Internet via one of our community computer stations. 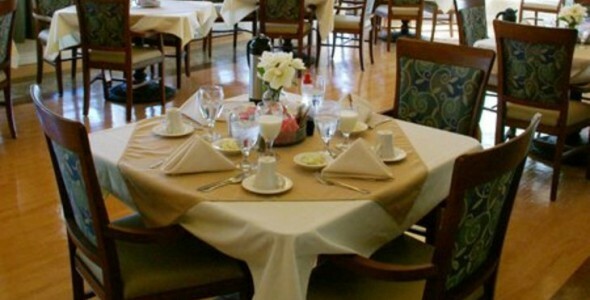 Daily meals are always prepared fresh and enjoyed in our restaurant-style dining room. Residents of Glassford Place have access to our on-site salon and barber shop. When wanting to participate in a group activity off site or needing to run a personal errand, we offer the added convenience of scheduled transportation services to a wide variety of area destinations. Our goal is to give our residents a warm and welcoming homelike environment. As needed, staff members are available 24 hours a day to lend a helping hand with life's daily activities. This might include help with personal hygiene, mobility or medication management. Glassford Place is available for residents interested in a fulfilled and independent lifestyle with the assistance of highly trained staff.